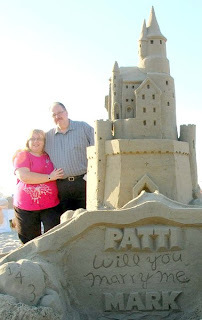 Congraulations Patti & Mark: We Hope You Enjoyed Your Custom Engagament Sand Castle – Archisand Professional Sand Sculptors, Inc.
“Patti, Will you marry me?” IN SAND! Congratulations again to our friends Patti & Mark on their beautiful engagement. Let our professional sand sculpting team help you pop the big question in a big way with our Custom Engagement & Wedding Sand Sculptures! Click HERE to visit Patti & Marks Wedding Website to view more photos from the big day!